When in a room filled with members from the adoption triad or adoption professionals, you always know when an adoptive parent speaks. No serious, it is so true. Every time I read through the comments on I Am Adopted’s Facebook page, immediately I know which group of the adoption triad is commenting. Adoptive parents are always the ones sticking up for the adoption industry, preaching about the orphan crisis, praising birth mothers, trying to compare an adoptees loss to another loss that that they may have experienced, invalidating adoptees, arguing with adoptees, calling adoptees names, the list goes on. 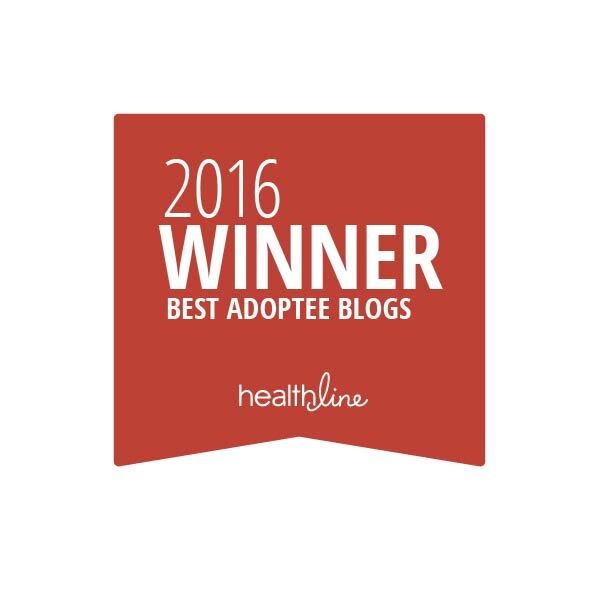 Do adoptive parents genuinely want to hear what adoptees have to say? Some, not all. 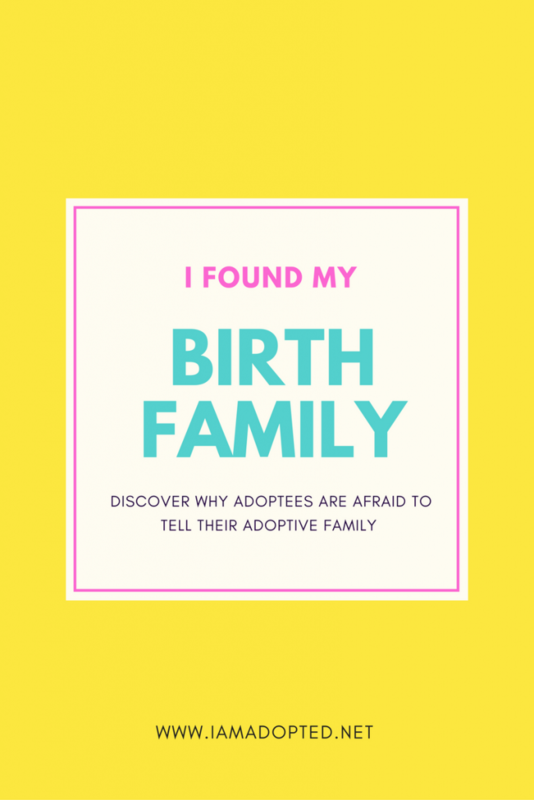 However, thankfully more and more adoptive parents are turning to groups like, I Am Adopted for guidance and delving into the adoptee experience in hopes to understand their adopted child. But what about the other ‘know-it-all’ adoptive parents? You know, the ones that say the absurd comments and the ones that like to spend hours debating with adoptees just to prove how necessary adoption is and how many children are being saved by two parents that aren’t qualified to be parents because they are either too young, unstable, or uneducated. #ThingsAdoptiveParentsSay...that shouldn’t be said ever again. I know what it feels like to not know my birth family; my dad walked out on us. Adoption trauma isn’t real. It is just a feeling that will pass. My child tells me all the time how thankful he is to be adopted. He is so happy to be chosen. What are you talking about, my child is happy and grateful to be adopted and has never experienced any trauma. We don’t see color, all we see is love. Why do you want to search for your birth family? Were we not enough? What did we do wrong? I chose you; you are special. Why would you want to find your birth mother? She gave you up. Obviously she didn’t want you. We love you and we are your family. I saved you from those horrible conditions in your country. Why would you want to go back there? I gave you everything you could ever want…. I know plenty of happy adoptees; you guys are just bitter. Every birth mother has the right to choose whether she wants to parent. I would never judge her choice. Not everyone deserves to be a mom. Why would you search for your birthmom? She’s probably married and has family. Can you imagine how that might disrupt her life? If your birthmother really loved you she would have never placed you for adoption. You are so angry, bitter, and ungrateful! My child doesn’t need to know they are adopted. We are his family and that is all that matters. I will tell my child he is adopted when he graduates from college this way it doesn’t interrupt his life. Why do I have to read about adoption? I have children of my own, I know how to parent. I just spent thousands of dollars to adopt my child from _____, at this point we cannot afford to just up and move to a more diverse community. We were ‘called’ to adopt. Adoption is in the bible. It is natural. We are your real family. We have been there for you through everything and have always taken care of you. These children deserve to have a better life. I am blessed to give them that. I know what it feels like to suffer loss my (insert family member or pet) passed away. Your mother loved you so much she gave you away. We have prayed for you for so long! You have no idea. Thank you Lord. I adopted because I didn’t want to ruin my figure or go through pregnancy pains. Every year we celebrate Gotcha Day with our little one. We are so blessed to have gotten him. You need to let go of the past. I know I may have ruffled a few adoptive parents feathers after writing this, however, it needed to be said. 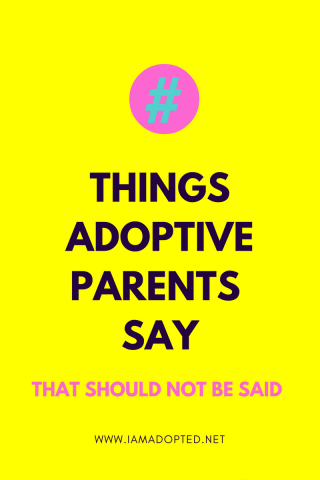 Some (not all) adoptive parents have no filter and just say anything without even thinking about adoptees or their own adopted child. This goes back to my previous post, putting your child first. 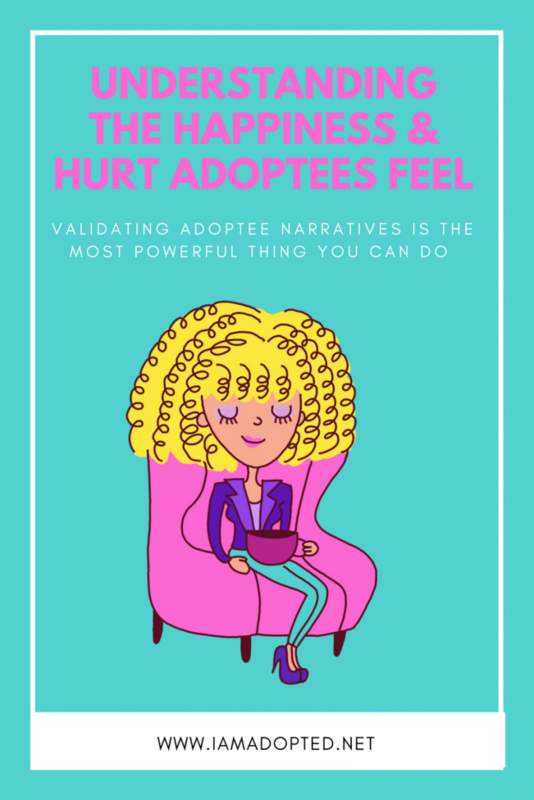 I cannot stress how important it is to listen to the narratives of adoptees even if it makes adoptive parents uncomfortable.Some of the things I have heard adoptive parents say are just disturbing leaving me to wonder how they even passed a home study or who they paid off to pass it. Goodness. But again, adoption agencies are primarily focused on the needs of adoptive parents, not adoptees. While adoptive parents are celebrating their ‘gain’ their child can be drowning in his or her loss. Not to mention what that child’s birth mother is experiencing. Please be mindful of the words you choose. Also, be mindful that while you are celebrating these Gotcha days and telling your child that they were chosen that adoptees are aware that thousands of other children weren’t as ‘lucky’; there is nothing to celebrate knowing other children will never have a forever home. Adoption is a journey, and parenting an adopted child takes patience, openness, education, understanding, and of course…UNCONDITIONAL LOVE. Adoptive parents cannot ignore the fact that their child is adopted and just plan on raising their adopted child as if he or she was conceived by their adoptive parents because they don’t see them any different. Adopted children are different and will always be different in some way. I don’t mean ‘different’ in a negative way just to be clear. The point is adopted children need to be aware and told that they are adopted. They need to know what it means to be adopted, and their narratives need to be validated and honored. Adopted children will always be adopted children even if they bond with a great family. Adoptive parents must never ignore the fact that his or her adopted child has feelings about being adopted. It needs to be talked about over and over again.Be slow to speak and easy to listen. Be cautious of your words. Remember that adopted children have feelings about their birth parents no matter what may have been done to them in their past prior to being adopted. Adoptees: What are some things adoptive parents say? What would you add? I'm a adoptive mom. I hate when people tell me (in front of my daughter especially) how lucky she is to have us as parents. We are lucky to have her in our life, but she and birth mom went/go through a lot of loss so that we can call ourselves a family. Thank you for sharing that with me. I remember specifically when I was in my pre-teens when strangers would say that to my adoptive mom in front of me and my sisters ( they are not adopted) at the grocery store. It would make me want to run and hide because I felt there was something wrong with me that I wasn't wanted by my birth mother. I wish people were more sensitive. Me too 🙁 that is why it is important that we teach sensitivity of adoption to society by using our voices and sharing our narratives. Agree wholeheartedly! I'm 39 years old and complete strangers still tell me how lucky and fortunate I am for having been adopted. Will never understand why people feel this is ok, or necessary. Society makes us feel like we should be pitied like there was something wrong with us or our birth family. It isn't right. And as you said, it isn't necessary. I think people just don't know what to say because I have heard that more times than I could ever count in my lifetime. 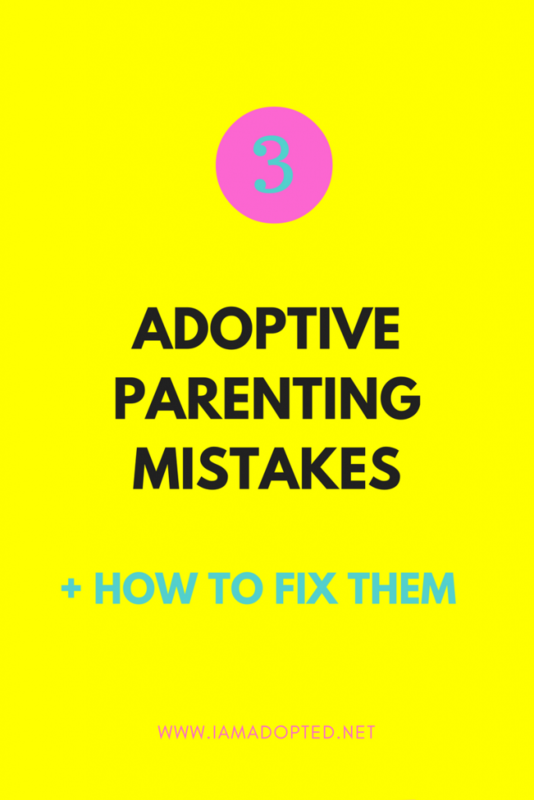 I'm also an adoptive mom, and this list is upsetting to read. It's hard to understand why any parent would say such a thing to their child. As Northern Star mentioned, I dislike when people tell me my children are lucky to have been adopted, I always respond that I'm very sure that I am the lucky one to have been blessed with such amazing children. Adoption is always based on loss, and I try to not lose sight of what my children have lost. It's clearer as they get older how much they've lost. My mom used to introduce me to people (in public places like restaurants) as her Adopted Daughter. It always made me uncomfortable to hear and to endure the various looks (or remarks) of the strangers. I felt even more different than ever when she did this! (what kid ever wants to feel different?) When I finally told her how much I hated her doing this, she was completely shocked and said she did it because she was proud to have adopted me. She stopped doing it after that but I don't think she truly understood. Asking about my birth mother and sister was always a charged situation fraught with tension. As a child, I'd ask for information hoping for something new each time but it was always the same story. Later, when I said I wanted to search she became furious and said I was ungrateful, didn't love her, already had a family, etc. As an adoptee, I felt like I was expected to be thankful for all the things that made me different but it only increased my lifelong abandonment issues. Hi Anonymous: Thank you for sharing. It sounds to me that at some point your adoptive mom had the intentions of adopting for her glory? Esteem? I only mention that because of what you shared in the beginning about her wanting to tell everyone she adopted and then later you express how upset she was that you wanted to search. She made adoption all about her when it should have been the other way around. I share the same sentiments as you 100 percent about being told especially in public that we are adopted to strangers. I am glad that you had the courage to tell her that you were uncomfortable with her introducing you as her 'adopted daughter'. I am glad she stopped. I am not so sure that she can truly understand how you or we as adoptees feel about those things because she isn't adopted. Those are feelings that are really only understood by us. I am sure she meant no harm (wishful thinking), but now I am sure she thinks twice and she will tell her friends if they adopt to think twice about doing that. As adoptees we don't want to feel different especially if we already look different and stick out. Just know, adoptee-to-adoptee, you are enough and you don't owe anyone JACK! You told have to be thankful or grateful. You just be you! I am sorry you are experiencing abandonment issues. I am too, and I may always will. But everyday I strive to tell myself positive affirmations to keep me strong on this journey to shut out those thoughts that sometimes haunt me. Having read that horrendous list of things people say about adoptees, I am ever thankful for being privy to the thoughts of so many adoptees who are speaking out regarding their experiences, the adoption industry and more. All of this makes me check myself, my white privilege and my intentions when speaking to my son, my adoption community and the public at large. Thank you. Hi Jacquelynn, first I would like to thank you for reading this blog post and sharing your thoughts. Thank you for joining my community. It is so important that adoptees and adoptive parents work together and learn about each other to create a successful adoption with open communication. That begins with knowing and understanding the struggles adoptees face from loss and the perceptions of society, validating them, and honoring everything that matters to your adopted child. It is interesting that you mention White privilege with what we have recently seen in the news. Over and over I share with adoptive parents how important it is to not ignore race/color. In fact, adoptive parents (white or fair skin) need to be very aware of their privilege and what it means to their adopted child of Color. So often I hear adoptive parents say, "we don't see color, all we see is love". It is very dangerous to have the mindset. Children of color – Black, Latino, Asian, etc. have to be prepared to be in the battle field when they are away from their White family. There is no one there to protect them when mommy and daddy are not present. These children are preyed upon in stores, on the streets, while driving. It is sad. 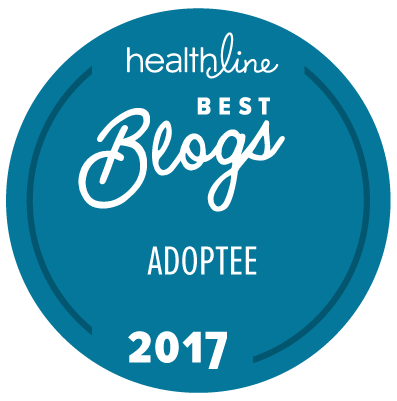 I am so glad that you are aware of these issues and you are educating yourself on adoptee related issues. reply to he looks just like you – oh he is adopted. I have come to believe that some, if not many, of the on-line awful & dismissive things that adoptive parents say are not accidentally ignorant, but rather a calculated means to send a message to adoptees that if we speak anything other than story(failry-tale)-line then we risk the love and stability of our adoptive homes. I say this as someone who has posted for a few years now about adoptee related issues and rights only to have the living crap kicked out of me for doing so. No matter how reasoned, reasonable, and even simplistic a statement I make, adoptive parent voices swoop in to twist my words, attack my adoptive parents (I never speak about them to avoid this, but they were good people and I have stated that much), and of course to attack me which almost always includes insinuating that I have a genetic malformation~and so does any other adoptee who speaks their truth. IMO, adoptees and those who care about them cannot only speak up on adopteecentric boards and blogs, but we must speak in "mixed" company, in the general public. My opinion, though, comes with a disclaimer: The acceptance of you and what you have to say will be based on how well you toe-the-line of the industry's talking points. And this, to me, is what it is like to be adopted. reply to my lack of "obedience": "we can get you packed and ready to go back to your whore mother quickly." the non-adopted have no idea how cruel adoptive parents are on a daily basis. I as a birth father would be very grateful to get my child back. I have cried so many tears these 30 years. I find the wall created by adoption appalling. So even when I hear an enlightened adopter, I wonder who's relationship was torn that may have been saved. Why does my child have to commit family genocide to survive in this world & to feel loved? This resonates with me. The privilege and colonialism of these statements are so telling. I am shocked people say them with a straight face. But they do. I love your blog. Check out this book about adopting with Biological children in the home. Its speaks on what wad mentioned in these comments. "I understand, I looked nothing like my family"
"At least you have your birth brother"
As an adoptive mom, I often wonder what the correct way to respond to outsiders' questions/comments. The most frequent one is "oh, your boys look so much like you!" I don't ever want to invalidate my boys or make them feel separate by responding incorrectly. I usually just say "we think they are pretty handsome!" and just avoid responding to the direct statement… but it's usually spoken in regards to them actually being adopted. What is your thought on this? It's hard to avoid saying the wrong thing, and as hard as we try, I'm sure we will make mistakes. I'm just praying our boys give us grace for the accidental mistakes and see how much we love them and honor them and their stories.